I asked a guy I dated if he were a brand, what would he be? He replied, “Soup Restaurant.” Because it’s homecooked food; everyone from the rich to the middle-class can enjoy it; there is great branding and marketing for the chain. Quite an original answer. But I’ve always preferred Dian Xiao Er to Soup Restaurant because it’s cheaper and the food is actually much better. Soup Restaurant is renowned for the soup and the samsui chicken, but at Dian Xiao Er, almost every dish is a specialty. So I find it strange that people were queuing for Soup Restaurant at Vivocity and not Dian Xiao Er. There is a set menu for up to 10 people: 2 people get 5 dishes, 3 get 6 dishes, 4 get 7 dishes and so now. We took the two-person set, and given a choice between pork ribs and dong-po ruo (fat pork), we, being health-conscious, took the fatter option. We didn’t know that Chrysanthemum tea isn’t tea, so it came in single glass, no re-fills and is charged more expensively. The five dishes are Angelica duck, braised pork, a veg (kai lan), soup of the day (lotus roots-pork rib soup) and RICE. Can anyone explain the concept of rice being a dish? Angelica duck, or Dan-Gui duck, is very fat and delectable. The duck flesh wasn’t infused with a herbal taste because the duck was not immersed in herbs. The herbal sauce was drizzled on the duck so although the flesh has no herbal taste, the non-immersion prevented the crispy skin from being soggy. You can’t have your herbal duck and eat it crisp too. The meat could have been more tender but no complains here. Love it! The braised pork, according to my eating kaki, melted instantly in the mouth. She said there was smell of pork but when she ate it, there wasn’t any stench, kinda like durian or smelly tofu. I like it too, and the portion was generous. Another win. DISH OF THE DAY: kai lan. I’m a carnivore so for a vegetable to achieve the dish of the day is like getting a bulldog to win a Dog Show, chances are never. 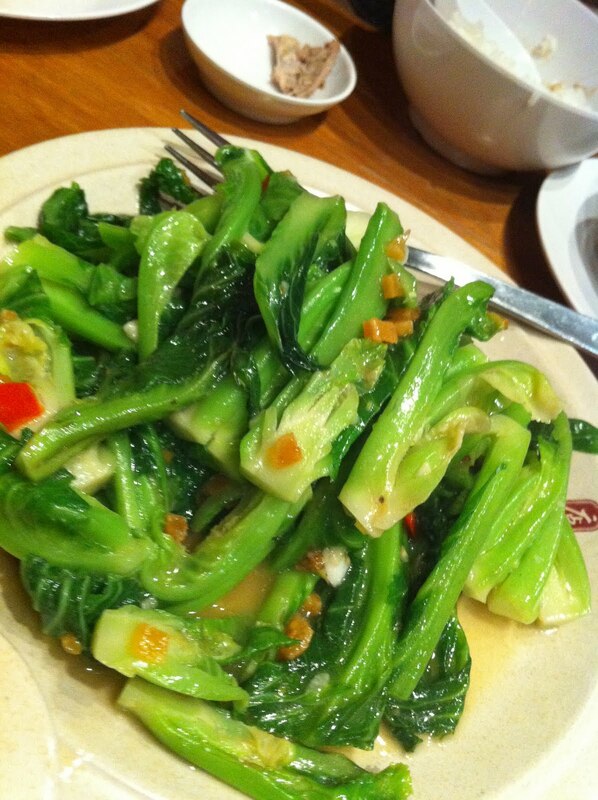 But this vegetable was fried in such a way that it was crispy and not oily. The delicate balance of spicy and sour taste (there was lime, I could tell) was reminiscent of Thai cuisine. Very appetizing. Another WIN. I love Chinese soups. All kinds, because it takes a long time for the essence of the ingredients to osmosize (what is the verb for osmosis??) into the soup. But this soup is disappointing because I could tell it wasn’t brewed for hours. Still can drink lah. Don’t be picky. We ordered xue ge (snow frog?) for our dessert. My partner didn’t quite like the overpowering ginseng taste and the frog’s saliva was clumpy and of a strange texture, unlike those I’ve eaten before. No desserts in the future. This is the second time I ate at Dian Xiao Er at Vivocity and for both times the food standard is delightful. However, there is of course no ambience to speak of, being a restaurant where people bring their elderly parents and young children. The service was varied, depending on different waiters and waitresses, some were more polite, and others looked overwrought. The set menu for two is $38, but including our drinks and desserts and taxes, the bill balloned to $63. Not that much difference from Soup Restaurant.